Actually my real name is Sue but don’t tell anyone. You are more than welcome to a slice of my garden . Thanks for the big shout and vodka which is gone…kidding). Good luck with your plant, let’s hope that the cats don’t eat it. Oh I’m so jealous, I wish some kind stranger would give me a bunch of wild garlic. I would prefer them to a bouquet of flowers any day. Lucky you! So thats what wild garlic looks like – Ive been looking for it all over the place in the…err….wild..but it appears a fellow Dan, and a fellow Essex dweller to boot is giving it out at train stations. That was kind and quite the assignation! What a smashing trade off. Enjoy your feast of garlic when it arrives. Gill. Congratulation on winning the No Croutons Required challenge. 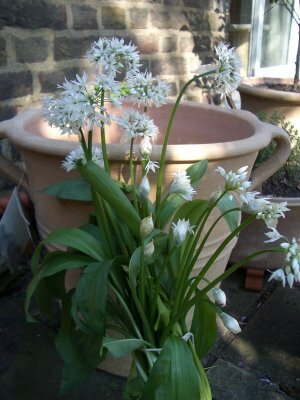 So far the wild garlic plant is settling in happily to its new home. It was a great trade with Dan. I’ve tried some of the flowers and they are lovely in a salad. Also saw lots growing in the wild yesterday. Mangocheeks: maybe get on twitter and see if you can find another kind man with garlic to spare. And thx for the congrats – I was VERY pleased to win. Dan 2: I’ve heard Dan 1 only gives plants to girls! Holler: The kind of assignation I like. Very pleased about my win. Hope to enter again soon I had such fun. Gill: Sloe vodka and gin are both good – the sloe taste is clearer in vodka. I’m happy with either and its so easy to do.